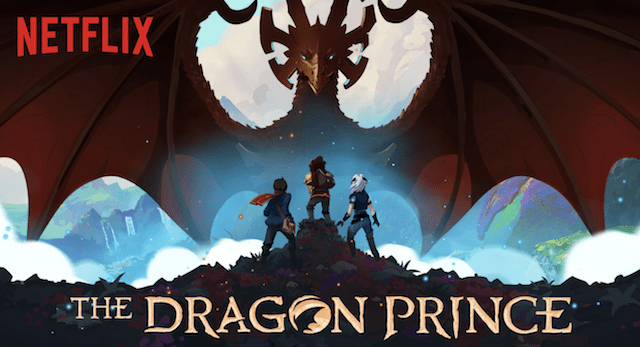 The Dragon Prince is an original series from the minds behind Avatar: The Last Airbender. The Dragon Prince was created and written by Aaron Ehasz (ATLA head writer) and Justin Richmond (Uncharted 3 director) with Giancarlo Volpe (ATLA director) directing. Xandia was once a land of unity and peace. The sun, moon, stars, earth, sky and ocean served as the 6 primal sources of magic in the land. 1,000 years ago, a human mage harnessed new power by stealing the life essence from magical creatures. This dark magic caused a rift among the inhabitants of Xandia. The elves and dragons united against the humans and cast them out to the west. War raged along the east-west divide. The dragon king known as Thunder guarded the border in order to protect his kind. The humans conjured an insidious dark magic which slew not only the dragon king, but the his only egg, his heir, the dragon prince as well. This depraved act proved to only stoke the flames of war. The human king Harrow learns of a moonshadow elf assassin team coming to claim his life. Accepting his fate as justice for past mistakes, he tells his sons Ezran and Callum to visit their winter home for a time. Callum, the step-son of the king, realizes the danger his father is in, but reluctantly obeys. While trying to locate Ezran, Callum encounters Rayla, one of the moon elf assassins. Prior to reaching the castle, the moonshadow elves performed an assassin binding ritual. Until the assassinations they bound themselves to are carried out, their arm bindings can not be removed. Ezran helps Callum escape from Rayla through a series of secret passageways, but she corners them in a hidden room. Ezran reveals to both Callum and Rayla that he recently discovered the dragon prince egg. Realizing the destruction of the egg was a lie, the trio decide that it must be returned to it’s mother in hopes of ending the war. Callum, Ezran and Rayla fend off humans and elves in order to escape from the castle and begin their journey. Callum steals a primal stone and begins his personal quest of becoming a mage. Just as they are about to leave the castle grounds, one of Rayla’s two bindings turns red and falls from her arm, signifying that one of the team’s targets has been eliminated. This unlikely trio begin their journey east, but continue to encounter obstacles. While they make their way across the land, Viren, the king’s former mage servant makes his play for the throne. He sends his son, Soren, and daughter, Claudia, out to locate the princes and recover the egg. While traveling, the dragon egg slips into freezing cold water and the light from within begins to fade. Ezran, Callum and Rayla search for a healer, but learn that the only chance of the dragon’s survival is that it hatch soon in the eye of a storm. Without a cloud in the sky, the group fears that their journey has been in vain. Before falling into complete despair, Callum retrieves his primal stone and smashes it into the ground releasing a massive storm contained from within. Chaos ensues, but Rayla is able to prevent the egg from flying off of the mountain. The egg begins to crack and the dragon prince is brought into the world. Finally, a glimmer of hope shines through the bleakness covering the land, but Viren’s children aren’t far behind. I’ll be blunt, I love this show. I was extremely hesitant about it at first, but all of my worries dissipated after the first few minutes of the premier episode. The writing is very well done. There is solid world building and character development over the course of the season. In only 9 episodes, nearly every major character completes a solid arc. You can feel the essence of Avatar: The Last Airbender while watching it, which is exactly what I was hoping for. It amazes me that a show rated TV-Y7 can be just as engaging for adults as it is for children. Every character has a unique personality that sets them apart from everyone else. There is a lot to love about The Dragon Prince, but one detail absolutely blew me away. When Ezran and Callum’s aunt Amaya showed up my heart melted. Not only is she a badass military general, but she’s deaf and signs! Commander Gren serves as her translator, but having her sign is groundbreaking. There’s a scene where she signs a prayer for her nephews without a translator for the audience and it is tremendously profound and beautiful. The inclusion of this character is just a testament to the thought, creativity and genius put into this show. The Dragon Prince is visually stunning with a solid score to match. Even the thought behind weaponry is astounding. The siege on the human castle by the moonshadow elves displays some extremely fun fighting techniques, abilities and weapon utility. More than anything, I love the way the show makes me feel. There are multiple moments that are profoundly deep and thought provoking. I honestly have nothing bad to say about the series aside from there being a few cheesy jokes. I could see someone saying the elements mirror Avatar: The Last Airbender too closely, but I would argue that The Dragon Prince is very much its own entity. I will say however that I was very pleased to hear the familiar voice of Jack De Sena (ATLA voice of Sokka) as Callum. If you love Avatar: The Last Airbender or are looking for a show for your entire family to enjoy, I strongly suggest you watch The Dragon Prince. With how well received the show has been so far, I’m sure season 2 will be announced fairly soon. You can find season 1 of The Dragon Prince streaming on Netflix now. If you’ve watched the show already, let me know in the comments below what you think. Now onto the next thing to binge watch. Great games, great value, great cause! Get your anime swag here!